Winter sport is now upon us (how did that even happen) and it seems like an appropriate time to discuss one of the most common injuries we come across in the clinic. 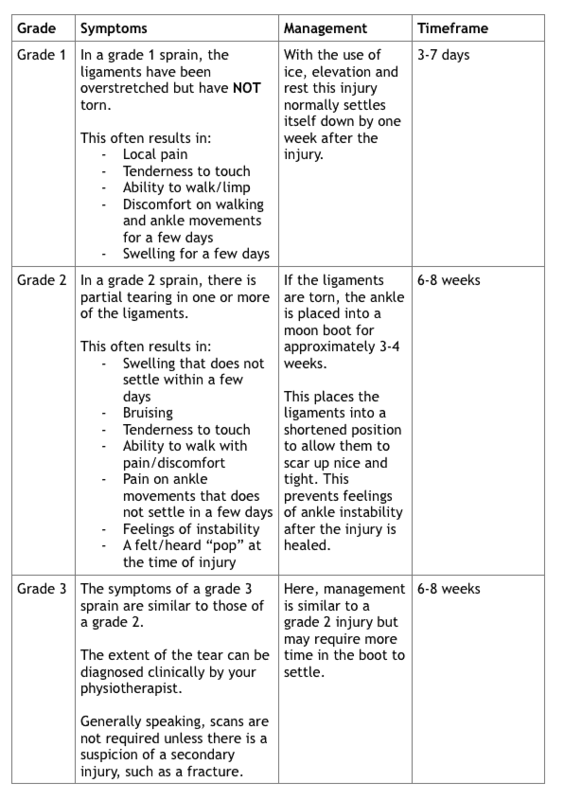 Lateral ankle sprains. Ankle sprains account for 90% of sprains and often result in tears in the lateral ankle ligaments. Being a lover of sport myself the odd rolled ankle here and there is no stranger, and inevitably when asked why I am limping I have fallen victim to the classic response “Its just a rolled ankle”. However, in the physio world things aren’t always that simple. Unfortunately, it is a common thing to see ankle sprains a few weeks down the track when patients report that their ankle just hasn’t settled. Often in these cases it is because things weren’t as simple as “just a rolled ankle”. A lateral ankle sprain occurs when the ankle gets rolled towards the body, placing a large amount of stress on the ligaments on the outside of the ankle. These ligaments are known as the ATFL (Anterior Talofibular Ligament), CFL (Calcaneofibular Ligament) and the PTFL (Posterior Talofibular Ligament). These ligaments contribute towards the stability of the ankle joint and the risk of re-injury in the future. Does it matter if its torn? In the case of ankle sprains, the extent of the ligament damage dictates how the injury is managed. The ligaments surrounding the ankle play a large roll in ankle stability, and if not properly managed can lead to ongoing ankle pain, instability and stiffness. Almost all ankle sprains can be treated without surgery. Even a complete ligament tear can heal without surgical repair if it is immobilised appropriately. Hence it is important to determine the extent of the injury to ensure that it is managed properly and ensures a rapid and safe return to sport and work duties. In the acute phase, it can be difficult to tell based on observation if it is “just a twinge” where there is a stretching of the ligaments with pain and some lateral ankle swelling, or if there is tearing in the lateral ligaments which will require proper rehab. If you have any concerns, it is best to have your ankle assessed. During the initial phase, physiotherapy will prioritise tissue healing and swelling management. This often involves manual therapy, education, and the provision of a moon boot. Exercise focus on maintaining ankle range and minimising stiffness. Once you can weight bear pain free, the boot will be gradually weaned, and targeted strengthening will begin to retrain the ankle stability and strength that is lost when the ankle is immobilised. The key is to remember that if your ankle doesn’t settle in the first few days following injury, it is best to pop into your local physiotherapist to have your ankle cleared to ensure a smooth and efficient recovery! Common Basketball Injuries – What To Look Out for and Prevention Tips For This Season! ACL – How We Can Help Prevent Injury!